Vice President and Prime Minister of the UAE and Ruler of Dubai His Highness Sheikh Mohammed bin Rashid Al Maktoum and Crown Prince of Abu Dhabi and Deputy Supreme Commander of the UAE Armed Forces His Highness Sheikh Mohamed bin Zayed Al Nahyan, yesterday inaugurated Warner Bros. World™ Abu Dhabi, the world’s first-ever Warner Bros. branded indoor theme park developed by Miral, Abu Dhabi’s creator of destinations, in partnership with Warner Bros. Entertainment, with an investment of $1 billion. YAS ISLAND, ABU DHABI, UNITED ARAB EMIRATES – July 23, 2018: HH Sheikh Mohamed bin Zayed Al Nahyan, Crown Prince of Abu Dhabi and Deputy Supreme Commander of the UAE Armed Forces (2nd R) and HH Sheikh Mohamed bin Rashid Al Maktoum, Vice-President, Prime Minister of the UAE, Ruler of Dubai and Minister of Defence (R), attend the opening of Warner Bros World Abu Dhabi. Seen with HH Sheikha Salama bint Mohamed bin Hamad bin Tahnoon Al Nahyan (3rd R) and HH Sheikha Fatima bint Mohamed bin Hamad bin Tahnoon Al Nahyan (L). HE Mohamed Khalifa Al Mubarak, Chairman of the Department of Culture and Tourism and Abu Dhabi Executive Council Member (L) and HH Sheikh Hamdan bin Mohamed Al Maktoum, Crown Prince of Dubai (2nd L). Their Highnesses attended the official inauguration ceremony, which took place in the Warner Bros. Plaza at Warner Bros. World Abu Dhabi. The ceremony included the first screening of the Warner Bros. Cinema Spectacular, a captivating show that brings Warner Bros.’ unparalleled film library to life. Guests were also treated to a series of festive celebrations incorporating the park’s beloved characters. Sheikh Zayed bin Ahmed bin Zayed Al Nahyan, Sheikh Saif and Sheikh Ahmed bin Hamed bin Zayed Al Nahyan then took the stage alongside some of the park’s iconic DC and Warner Bros. Animation characters to press a button marking the official opening of the highly anticipated theme park, which is expected to draw in thousands of guests including residents and tourists of all ages. Following the opening ceremony His Highness Sheikh Mohamed bin Rashid and His Highness Sheikh Mohamed bin Zayed toured the park, which officially opens to the public on 25th of July. The opening of the Warner Bros. World Abu Dhabi marks the latest addition to Yas Island’s offering of world-class tourism and entertainment attractions, and serves to strengthen the island’s position as a leading leisure and entertainment destination in Abu Dhabi, further enhancing UAE’s distinguished position on the world map. During the tour, their Highnesses were briefed on the many elements which help bring the park’s immersive environments to life across its six lands. From the meticulously curated musical arrangements to the faithfully created landscapes, each land is uniquely designed to truly immerse guests in the places they’ve seen in movies, comic books and on TV. Their Highnesses also learned of the different stages of development which the park underwent as well as its adherence to the internationally recognized best practices and rigorous health and safety standards to ensure the wellbeing of its guests. During the tour, their Highnesses also visited the park’s wide array of facilities and state-of-the-art attractions. “It is with great pride that we open Warner Bros. World Abu Dhabi on Yas Island today. This is a milestone moment for us as we continue to cement Abu Dhabi’s positioning as one of the world’s leading family and tourism destinations. I am confident that the addition of this theme park to our already rich portfolio will further enhance Yas Island’s offering,” said H.E. Mohamed Khalifa Al Mubarak, Chairman of Miral. “We’re delighted that our partnership with Warner Bros. has resulted in us delivering our promise of creating an attraction that will amaze and entertain both the young, and the young at heart,” added H.E. Al Mubarak. Filled to the brim with endless family fun and adventures, the park transports guests to six expertly designed lands, including DC’s Metropolis and Gotham City, as well as Cartoon Junction, Bedrock, Dynamite Gulch and Warner Bros. Plaza. Home to a total of 29 exhilarating rides, interactive family-friendly attractions and unique live entertainment shows, the park will offer an incredible range of themed experiences. 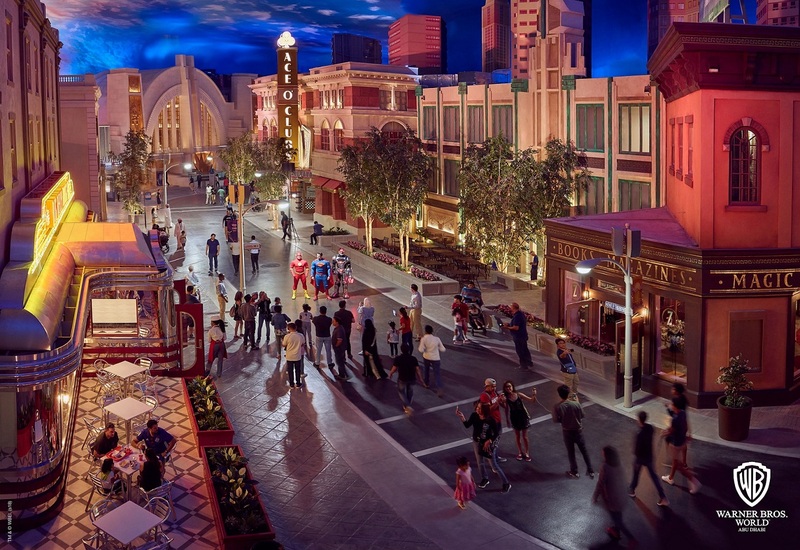 Guests will also enjoy authentically themed dining experiences, from grab-and-go eateries to full-service sit-down restaurants and cafes, as well as custom designed shops featuring bespoke Warner Bros. merchandise inspired by fan-favorite characters, some of which has been developed exclusively for the park. “Warner Bros. has an almost-100-year legacy of producing and distributing high-quality entertainment to global audiences, and this world-class attraction continues that tradition in grand style,” said Kevin Tsujihara, Chairman and CEO, Warner Bros. “Warner Bros. World Abu Dhabi literally brings our characters to life and provides fans a truly unique immersive entertainment experience. We couldn’t have better partners than our colleagues at Miral, and we look forward to continuing our longstanding relationship,” he continued. The excitement begins in Warner Bros. Plaza, where guests can meander the streets of the art deco themed portal to the various lands of Warner Bros. World Abu Dhabi. Guests can enjoy the gleaming urban landscape of Metropolis, where they can revel in the heroic optimism of the Justice League – whose members include Wonder Woman, Green Lantern and The Flash. They can then make their way to the dark alleys of Gotham City where devious masterminds such as The Joker, and Harley Quinn wreak havoc only to be thwarted by Batman. In contrast, bright blue skies and fluffy white clouds will surround the guests in Cartoon Junction where childhood favorite characters come to life. Guests will then leave the colorful houses behind for the lofty dunes of Dynamite Gulch packed full of animated antics and mad mishaps. And finally, guests can rewind all the way to the modern Stone Age in Bedrock with the lovable cave-families – The Flintstones and The Rubbles. Warner Bros. World Abu Dhabi is the latest addition to Yas Island’s immersive theme parks including Ferrari World Abu Dhabi, Yas Waterworld Abu Dhabi and the upcoming attraction, CLYMB. These are complemented by: Yas Marina Circuit – one of the most technologically-advanced Formula 1® circuits in the world; Yas Marina – a vibrant venue offering dining, fitness and leisure facilities; Yas Mall – the largest shopping mall in Abu Dhabi with 400 retail stores; Yas Beach; and, Yas Links Abu Dhabi – the 46th golf course in the world, as well as seven sophisticated hotels ranging from 3 to 5 stars. To purchase tickets or learn more about Warner Bros. World Abu Dhabi, visit www.wbworld.com and join the conversation on social using the hashtag #WBWorld.